Michelangelo's dome was only completed to the base when he died. 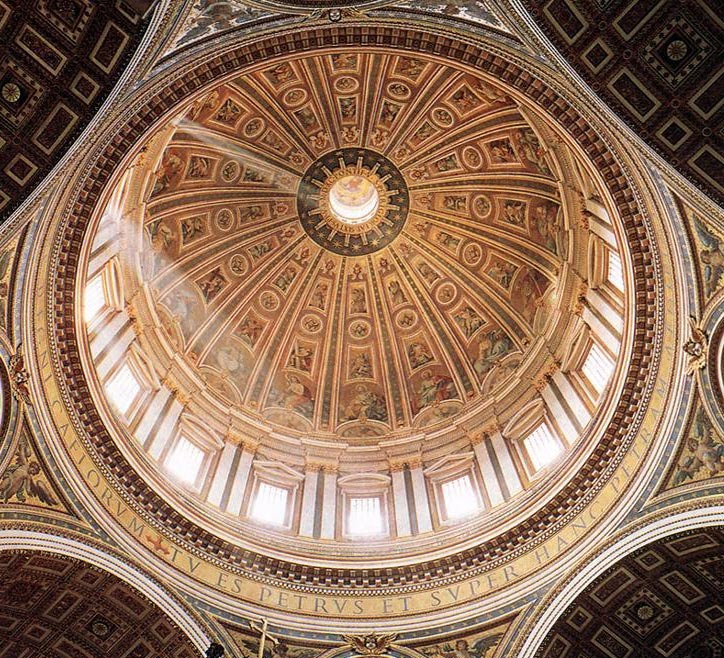 The great dome soars above the altar and the baldacchino, sumptuously embellished with mosaic and stucco ornaments. It is supported by four structural piers with a perimeter of 71 m. and a height of 120 m. from the ground to the roof of the lantern. The giant letters on a gold background, from St. Veronica to St. Helen, say "Hinc una fides mundo refulgent" (From here a single faith shines throughout the world); and from St. Longinus to St. Andrew: "Hinc sacerdotii unitas exoritur" (From here is born the unity of the priesthood). In the four spandrels which link the square piers and the circular drum, the four Evangelists are portrayed in medallions with a diameter of 8.5 m.: Matthew with the ox, Mark with the lion, Luke with the angel and John with the eagle. Around the base of the drum we can read the solemn words from Matthew's Gospel with which Jesus invests Peter with supreme authority. 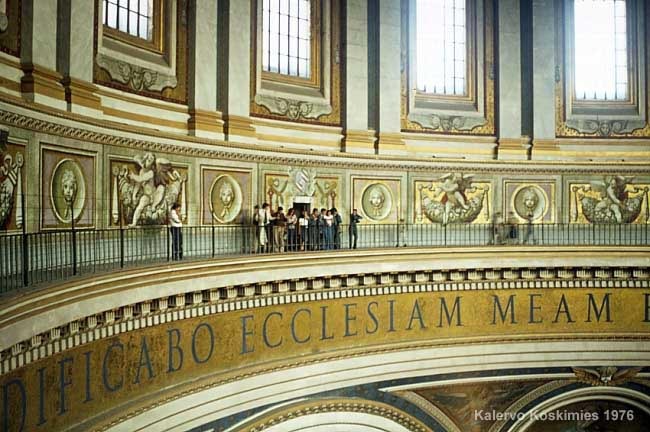 The text reads: "Tu es Petrus et super hanc petram aedificabo ecclesiam mean et tibi dabo claves regni caelorum" ("You are 'Rock' and on this rock I will build my Church, to you I will give the keys of the kingdom of heaven." Mt 16:18). The gigantic black letters (2 m. high) of this text on a gold background are lit by the light from 16 large windows, typical of Michelangelo's style, which punctuate the drum. 6. additional faces of winged angels. 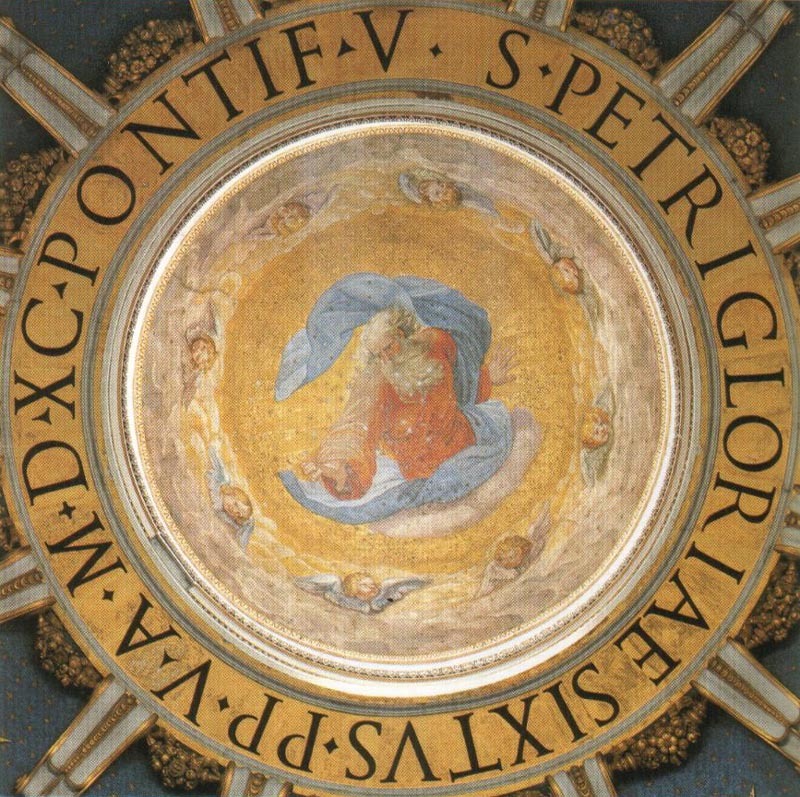 Above the 96 figures is a blue sky spangled with stars, and above it the lantern at whose base is a Latin inscription: "To the glory of St. Peter, Pope Sixtus V in the year 1590, the fifth of his pontificate". The eye then penetrates the lantern which is 18 m. long, and as in a vision come to rest on the glorious figure of God the Father. Many artists worked on these decorations. Clement VIII commissioned Giuseppe Cesari, known as Cavalier d'Arpino (1568-1640) to carry out the upper part of the decoration. He prepared the cartoons from 1603 to 1612. His drawings were simultaneously transposed into mosaic by the best mosaic artists of the period. In fact, the 16th century was coming to an end when Giovanni de' Vecchi and Cesare Nebbia were commissioned to decorate the pediments of the great dome, with the representation in tondos of the four Evangelists: St. John (with the symbol of the eagle), St. Luke (calf), St. Mark (lion) and St. Matthew (angel); the contiguous upper triangles are decorated with angels designed by Cesare Roncalli. 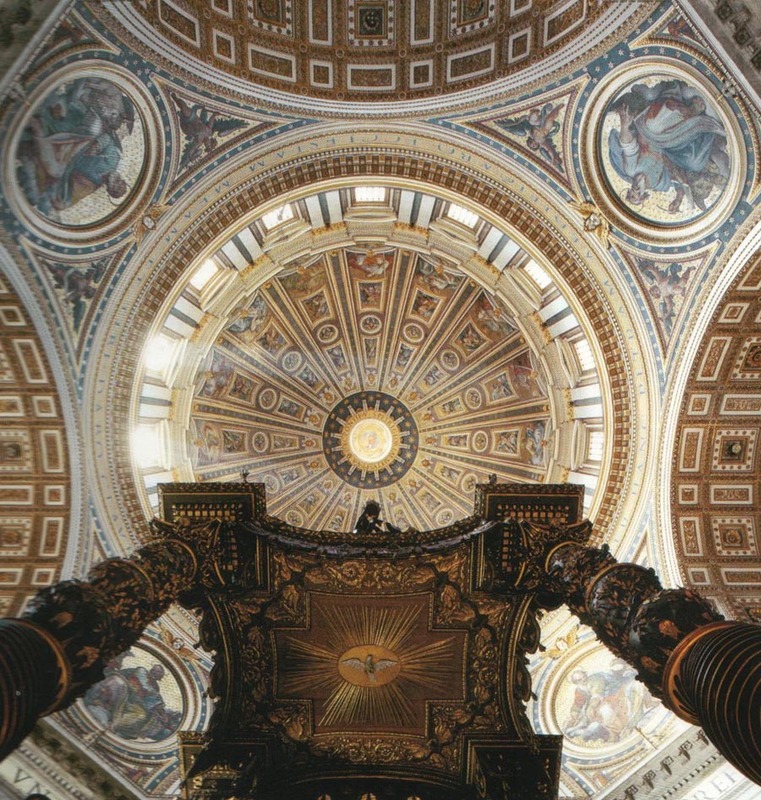 This was followed by the decoration of the large dome, divided by 16 vaulting ribs which, within six fields, enclose: at the bottom, the Pope Saints buried in St. Peter's and the large figures of Christ, the Virgin, St. Paul the Baptist and the 12 Apostles; above, inside frames, angels with instruments of passion and heads of cherubs inside round medallions, followed by angels in adoration within frames and finally heads of Seraphims. The top border bears the words S. PETRI GLORIAE SIXTUS PP. V.A. MDXC PONTIF. 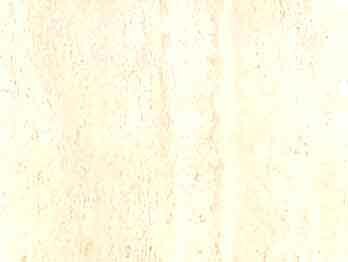 V., which was inscribed according to the wishes of Clement VIII in memory of the promoter of such a great work. 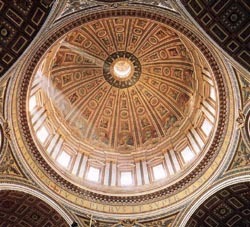 Above, this is connected to the clerestory terminating in a small dome that glorifies the Eternal Father. The iconographic layout, in which the possibility of viewing the details does not affect the overall harmonious vision, was executed by Cavalier d'Arpino who created 65 life-size cartoons painted with tempera, 16 of which were preserved in the Abbey of Montecassino. The transfer to mosaic, executed by the best mosaic artists of the period (Turchi, Torelli, Rossetti, Abatini, Serafini) under the direction of Provenzale, and which continued up to the papacy of Paul V, skillfully expressed the decorative intentions of the artist, with a beautiful chromatic effect. Based on two main colors, the dominant light blue and the vibrant gold, this composition utilizes the diffuse light that penetrates uniformly through the immense intrados, from the large Michelangelo windows, surmounted by curving and alternating triangular architraves and enclosed by coupled pilaster strips. A show of color and lights that enhances the spatial aspect of the architectural structures, instilling deep emotions in the spectator, at any time of the day and from any point of view, that is an effective introduction to a meditative visit to the underlying Confession: the focal point of the origin and construction of St. Peter's two Basilicas - the early-Christian and present-day structures. 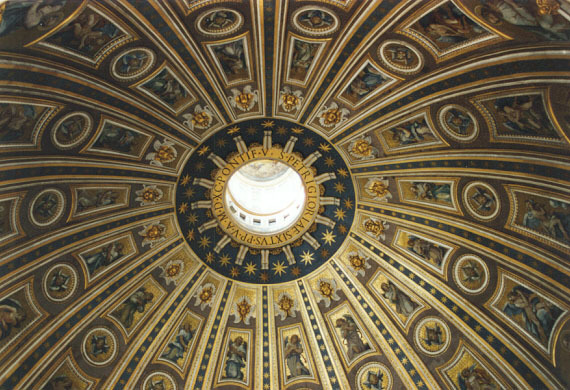 The decoration of the intrados of the cupola was 1593 onwards in the hands of Giovanni Guerra, Cesare Nebbia, and Marcantonio Bosco, who organized the so-called "exhibitions" to study the effect of their cartoons seen from below. In the four medallions of the corbels below the cupola, (28 feet in diameter), Giovanni De Vecchi portrayed directly in mosaic Saint John the Evangelist and Saint Luke; Cesare Nebbia of Orvieto designed Saint Mark and Saint Matthew (the pen of the former is almost 9 feet long). The angels and cherubim are by Cristoforo Roncalli and Giuseppe Cesare d'Arpino; there are Popes and Saints also by Giovanni Guerra and Cesare Nebbia; the decorative motifs between the 16 ribs of the vaulting are by Cristoforo Pomarancio. At the plinth of the drum the diameter of the cupola is 139 feet, and in this immense space the artists placed their 96 figures. Marcantonio Bosco painted the architrave, the frieze and the cornices; Ercole da Fano the eye of the lantern. We know that Orazio Gentileschi was also involved in this gigantic series of pictures, but the documents do not specify his contribution. The cartoons of the painters were transformed into mosaic by a team of artisans: Cesare Torelli, Donato Parigi, Ranuccio Semprevivo and Rosario Parasole. They also executed the mosaic of the lantern. Between 1605 and 1606 Ventura painted the letters of the Tue es Petrus and Piero Pomodoro applied the gold and blue. The letters are over 4.5 feet high. Above them is the ambulatory, 433 feet in circumference. Rocco Solaro modeled in stucco the 14 types of animals chosen to decorate the windows, the so-called "mountains" of the piers of the drum, the candlesticks of the niches, and all the mouldings. The drum is 65.6 feet high and contains 16 windows with alternating frontispieces between Corinthian pilasters supporting the beams and cornice. At this point one is 240 feet from the ground, and here begins the cupola erected by Sixtus V, who is commemorated by the lions' heads taken from his armorial bearings. From the floor to the arms of the cross, the basilica is 450 feet high.